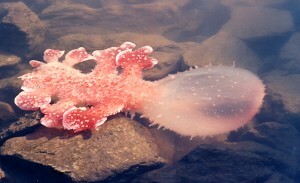 Looking for all the world like a science-fiction alien, this enormous species of nudibranch (reaching a length of over 50cm) has been commonly observed in south-east Queensland by divers and caught in nets of commercial trawlers. It can actively swim and occasionally appears near the sea surface, but in fact prefers to spend much of its time on or near the bottom preying on small crustaceans with the aid of its extensive, spoon-like, oral hood. The hood traps prey and transfers them to the mouth for ingestion. The club-shaped lateral projections of the body (cerata), together with muscular flexure of the central body, collectively aid in swimming. The photo shows a 45cm specimen living in a canal estate at Wellington Point in Moreton Bay. Indo-West Pacific (sporadic): subtropical and tropical Australia.